Description: Mount Vernon Mantels brings decades of experience to the design and manufacture of custom wood fireplace mantels. Our team of experts will create a magnificent mantelpiece or fireplace mantel shelf for your home, built to your exact specifications. The Homestead Collection — a modern take on a traditional look. The American Collection — an excellent way to give a room a sense of charm and character. The Independence Collection — modular structural and aesthetic options that result in beautiful masterpieces. The Fillmore Collection — a perfect choice to balance a larger room with deeper shelves and turned columns. Cabinets — select a handsome Mount Vernon Mantels fireplace mantel cabinet to add fine furniture and built-in features. 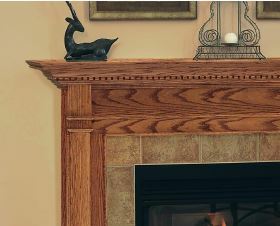 Wood Fireplace Mantel Shelves — are the perfect solution when you have limited space or prefer a simpler hearth design.